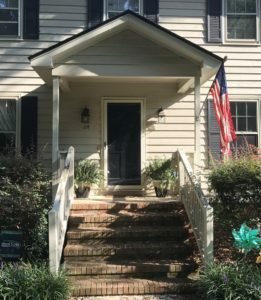 We were contacted by clients in Cary to make some revisions to their 1970s colonial. 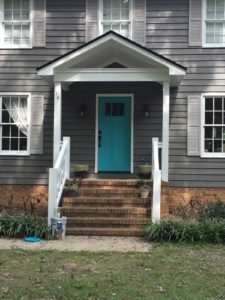 They love the house but wanted a new, fresh look for the front facade, and a new front door, with windows for added light. 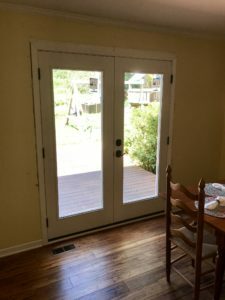 They also wanted us to remove a window bay in the dining room, and replace with a set of French doors. The results are pretty dramatic, a major improvement — best told visually, through “before and after” pictures. 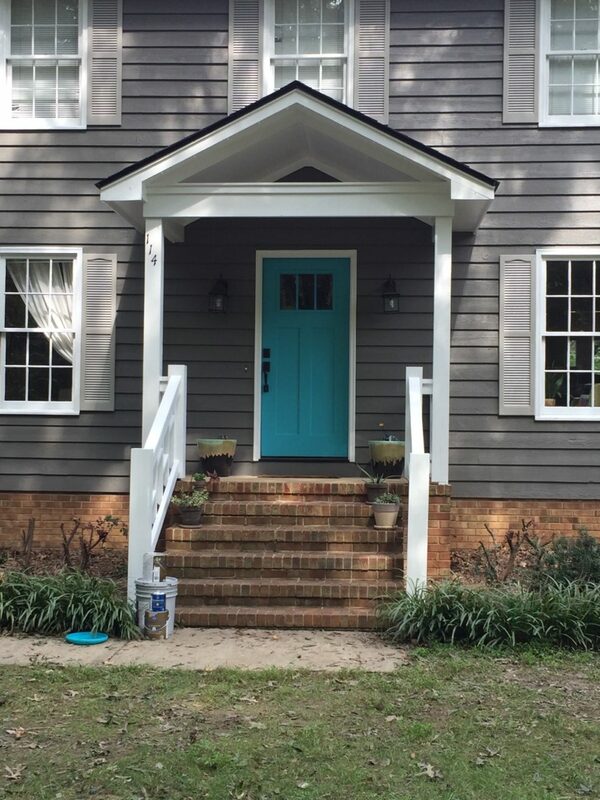 A new front door with 3 top-light windows, and “opening up” the whole portico. 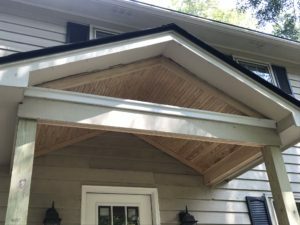 We liked the idea and suggested Tongue & Groove boarding up above, so when you stood under the portico and looked up there would be a cool, appealing design element. 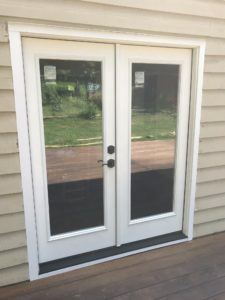 In addition, they wanted to take out a window unit in their dining room, enlarge that opening, and add a French door unit, giving them better access to their back deck. 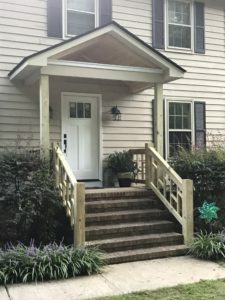 Once the clients approved the bid and put down a deposit, we bought the materials and scheduled the delivery. The materials were delivered the next week and we went to work. First up. 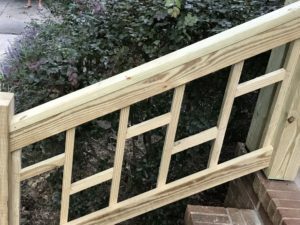 tearing out the portico lumber & porch railings, which we thought would take just a few hours, but it wound up taking all day. 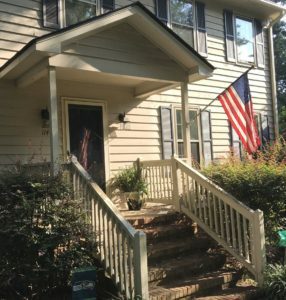 The railings were easy, but the portico was slow going…like peeling back layers of an onion. Layers and layers of layers. We’d take out a few old 2x6s and there would be another two underneath. One trim element, with a few more underneath. Rafters, with an over-kill amount added for good measure. 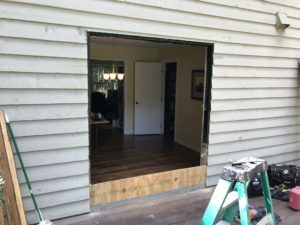 About the only thing relatively easy was removing the plywood “ceiling.” But even that was a bit of a pain — we had to cut it into sections to remove it. 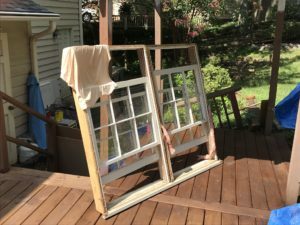 Also necessary was taking down several pieces of siding, which were stowed away for later use. Once all of that was done we shored and jacked up the temporary support beams for the portico. The opening was near perfect, and the doors slipped into place beautifully. Hardly any “dead” space between the framing and door unit. 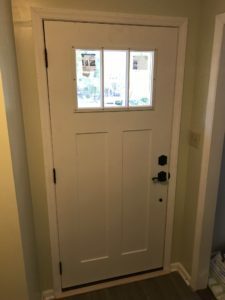 So we installed the door, made all of the multiple shimming and leveling adjustments, installed the hardware/deadbolt, and trimmed it with pine moulding inside, and PVC on the outside. We also had to go into the crawlspace and apply a few shims to correct a small gap created by house settling under the door, but again, no biggie. Now, onto the installation of that Tongue & Groove for the new porch ceiling: Measure, cut, fit, nail gun. The end result is very cool. It is both updated, and retro. 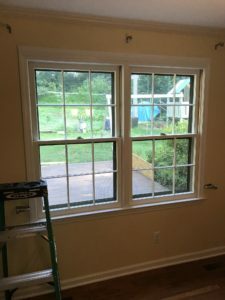 We then trimmed it all out with some sturdy treated pine and PVC, and cut those removed siding pieces to fit the new dimensions, then reinstalled. 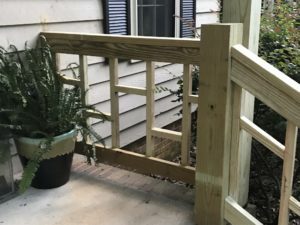 Finally, the porch railings. She’d suggested a pattern known in the design world as “Chinese Chippendale.” We also thought that was a perfect updating feature. 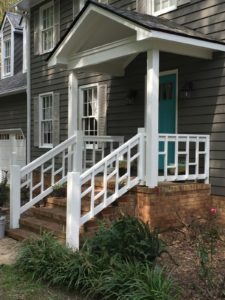 The end result is a dramatic update to the facade of the house, using new design elements (opening up the portico), with the retro cool of the Tongue & Groove portico ceiling and new, intricate railing form. All of the projects, combined, took about 7 days. 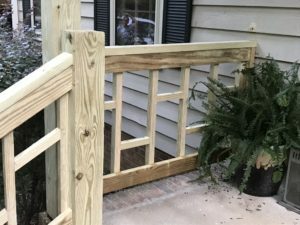 It was a fun project and everyone’s really happy with the results.